Māoriland Film Festival is an international festival that celebrates Indigenous voices and storytelling in film. Each March, Māoriland presents a selection of the most distinctive Indigenous works from around the globe. BLACKBIRD was included in the official programme and Amie was able to participate in the 72 hour filmmaking challenge Native Slam – an innovative and collaborative filmmaking project connecting international indigenous filmmakers. In addition, BLACKBIRD picked up the People’s Choice Award for Best Short Film. Congratulations to all cast and crew and big ups to those who supported the crowdfunding campaign to make the film happen. It’s heartening to know that this story inspired by a dark part of Australian history is being recognised and is resonating with festival audiences. Director Amie Batalibasi at BLACKBIRD’s Q&A session at Māoriland Film Festival Whenua Shorts program with Tainui Stephens Māoriland Charitable Trust Chair and filmmakers Kelton Stepanowich and Jason Taouma . Image by Tina Haresnape and courtesy of the festival. Amie participated in panel with Maya Solis of the Sundance Institute Native and Indigenous Film Program including filmmakers Danis Goulet and Michelle Latimer. Image by Tina Haresnape and courtesy of the festival. Other news is that BLACKBIRD will screen at the St Kilda Film Festival in Melbourne on 21 May, 4pm as the film’s official Melbourne premiere as part of the Top 100 Australian Shorts programme! Event details here. ABOVE: With actors Rosa & Shrut on the set of FRESH: Episode 3. Image: Dana Simon courtesy of FRESH. On set with Director of Photography Sky Davies and 1st AC Max Duhamel. Image by Dana Simon courtesy of FRESH. Amie recently directed an episode of the upcoming web series FRESH, produced by Simon Trevorrow and Nikki Tran (who is also the writer). 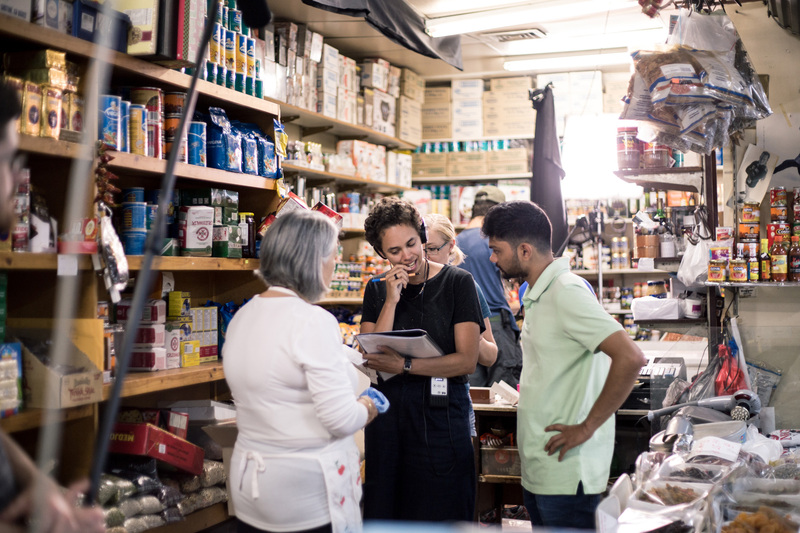 FRESH is “a comedy web series that is a little about food and a lot about the people who brought the different flavours to this country as they face modern life, big business and each other”. Episode 3 is called ‘Cannoli’ and it’s set within the market in a deli run by an Italian couple. A fantastic crew and wonderful actors Rosa Nix and Shrut Parmer (pictured above) were on board. The FRESH team were also able to unearth some ‘fresh’ acting talent – Tony Cavallaro of the famous cannoli shop in Footscray was also in the episode! (If you haven’t had the best cannoli in Melbourne you need to visit his shop in Footscray!). Stay tuned to the FRESH Facebook page for updates about this web series here. FRESH rehearsal with Tony, Rosa, Nikki and the best cannoli in Melbourne. Back in August of 2016, Amie worked with emerging actress Nyawuda Chuol on a video art projection work entitled LIT for the West Projections Festival in Footscray. The work evolved out of a conversation we had about the lack of representation of women of colour in Australian mainstream media, film and TV. This March, LIT screened as part of the Melbourne Women in Film Festival. Nyawuda and Amie were invited to speak as part of a panel Making, Writing, Doing: Women Getting a Start in Screen Culture moderated by Vy Wijekumar (Human Rights Arts & Film Festival) including writer/director Nora Niasari, and film critic and Artistic Director of the Czech and Slovak Film Festival of Australia, Cerise Howard. The panelists explored their experiences in the film industry, funding, diversity, representation and the difficulties and challenges faced along the way. L-R: Cerise Howard, Nora Niasari, Amie Batalibasi, Nyawuda Chuol, Vy Wijekumar. Image by K Phillips Photography and Courtesy of MWFF.